Train smart and play your best Tennis! Everything you need to train for your Tennis! Our training programs include Fitness & Conditioning, Speed & Agility training, Movement, Strength & Power training sessions designed specifically for Tennis. Our Tennis training programs are designed by the Pros to MAXIMISE your sporting performance – used by ATP, Davis Cup and National Junior athletes. 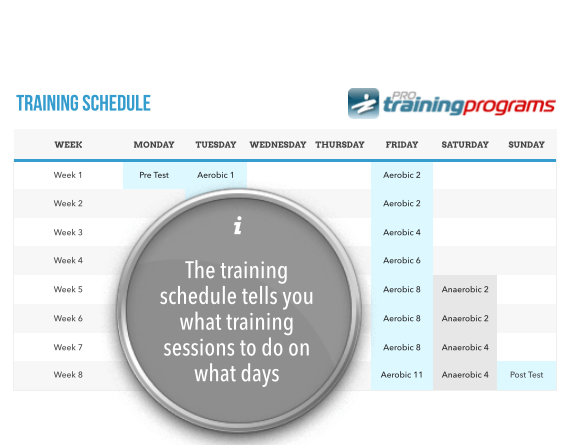 Tennis training programs are delivered instantly by email so you can start training today! Our Tennis training programs are tailored to your level of experience so it doesn’t matter if you have just started playing Tennis or if you have been playing for years. Our PDF training programs are easy to follow, and have everything you need to train for your sport, so you can get the most out of your training! All Tennis training programs follow a progressive 8 week Training Schedule, with 2 – 4 x 1.5 hour training sessions per week – note that each training session includes a combination of court/field and gym exercises. and Tennis In Season training. Tennis Fitness & Conditioning Training Sessions and Exercises focus on developing Tennis specific anaerobic and aerobic fitness. Tennis fitness sessions include a Warm Up, General Acceleration & Agility and Conditioning. Tennis Movement Training Sessions and Exercises focus on developing Tennis specific Quick Feet, General Speed & Acceleration Mechanics, Integrated Movements, Shadow Swings & Specific Footwork, and Tennis Specific Patterns. Tennis Strength & Power Training Sessions and Exercises focus on Tennis specific Strength & Power development. Over 100 Tennis specific exercises in each Tennis Training Program. Includes custom Tennis exercises Wide Forehand Lateral Medball Slams, Acceleration Volley Catches, Reactive Short Ball Drops and many more. Not all training programs are created equal. Learn more about what makes a great Tennis Training Program. This is not Bootcamp, not Crossfit, and not just another training program written by a Personal Trainer. What we offer is Tennis specific training programs, written by the best coaches, trainers and athletes in your sport, designed to MAXIMISE your sporting performance! Tennis is a racquet sport played by either two opposing players (singles) or two opposing pairs (doubles), that take positions on opposite halves of a rectangular court divided by a net. Tennis is played by millions of recreational players and is also a popular worldwide spectator sport. A tennis match is characterised by repeated bouts of high-intensity activity. However, a typical rally may last about 6 seconds and not much more than 10 seconds even on a clay court. Between points there is the luxury of up to 25 seconds rest – 90 seconds if it’s a changeover. Hence, the overall physical demand is closer to prolonged moderate-intensity exercise (such as distance running) than a true multi sprint sport (such as soccer). The sport of tennis involves all the major muscle groups and many aspects of performance, including strength, power, speed, coordination, agility, flexibility, and endurance. Training to maximise performance in all these areas simultaneously is a difficult task. A tennis training program must be based on solid aerobic endurance to sustain a high work rate for the duration of a game that may last several hours. Anaerobic endurance is also an essential component so that power over each rally, and in each shot within a rally can be maintained to same high level. On average a tennis player will move just 3 meters per shot and 8-12 meters during a point. It becomes obvious that good speed and quickness around the court is essential in order to reach the majority of these shots. During a match 48% of a players movement is sideways so agility, or the ability to change direction rapidly and under control becomes equally as important. Finally, a balanced tennis training program should help to prevent injury and over training. For example, a preventative program of wrist extensor strengthening and stretching exercises can help to prevent tennis elbow. Specific exercises can also be prescribed to reduce the risk of rotator cuff damage. The goal of this program is not only to improve your performance, but also to help you meet and withstand the demands of tennis. This means that not only will you become stronger and more explosive but your body will also function better, move better and be more resistant to injury. The first four week, block of training is called the foundational training phase. These sessions will focus on correcting imbalances while creating a strength base. This will ensure that the body is functioning optimally and better prepared for the later stages of training. The second four week, block of training moves into what is called an intensification training phase. During this training block, you will shift from unilateral movements to compound exercises emphasizing heavier loads and explosive contractions. This will result in performance improvements coming from an increase in relative strength and the ability to produce explosive movements. The movement sessions in this program are designed to not only improve your speed on the court but also the quality of your footwork. Becoming more powerful while developing efficiency will ensure you are able to play at the highest intensity while conserving energy and preventing injuries. The first four weeks will focus on developing coordination and the development of power through low complexity plyometrics and footwork patterns. As the program progresses the difficulty and complexity will increase. In the seconds four weeks there will be a distinct increase in intensity. The plyometric exercises place a greater emphasis on utilizing the stretch reflex, developing reactive and explosive strength. You will also take advantage of the movement quality and power you have developed as you test your ability to string together more complicated footwork sequences at higher speeds. All the skills and tactics in the world will be of no use if an athlete does not have the endurance to support them. Tennis creates an interesting challenge from a conditioning perspective. The individual rallies are 7 – 15 second bursts of high intensity efforts. This requires a well developed Anaerobic a-lactic System. However, the time between rallies is insufficient to completely restore the energy expended. Over the course of a few rallies a deficit builds up and fatigue sets in. However it is possible to minimize the decrease in performance through the development of the Anaerobic Lactic and Aerobic energy systems. With all energy systems working together to support the production and recovery of energy it is possible to perform at a high speeds and intensity over the course of an entire match. In the early stages of the program the primary focus will be on building your aerobic base. This will develop a tolerance for higher training volumes and the capacity to recover from high intensity efforts. As you progress through the program the emphasis will move toward higher intensity. Moving beyond your anaerobic threshold, where the aerobic system becomes insufficient in meeting energy demands is where performance improvements will become more noticeable. To do this we will utilize interval training of increasingly higher intensity. Ultimately, the goal of this program is to transfer improvements in fitness to the sport of tennis. With this in mind as you move through the program the conditioning methods will move from a more general nature, utilizing equipment like the stationary bike, to shuttle runs on the courts, to actual sport specific movement like footwork patterns. *Product disclaimer: results may vary from person to person. When choosing your Training Program, think about your training experience, how many days per week you can train, and what season you are in (Pre Season, In Season, Off Season)! Click the email us button at the bottom of this page to learn more and to join!